Introducing our 2-4-1 fairs discount card which is a great new benefit of CGS membership. 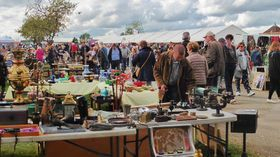 The Society has negotiated discounted admission with the organisers of some of the largest antiques and collectors fairs in the UK. Two Carnival Glass Society members (or 1 plus guest) can attend each participating fair for the price of one admission ticket on production of their CGS 2-4-1 discount card. It can be used on over 80 fair dates at 10 locations across the UK with significant savings available giving members who attend these fairs the potential to save 10s not £100 of pounds each year. So it’s well worth having if you live in the UK or are planning a visit. If you are not already member of the CGS : to get your discount card and start making these savings ‘Join the CGS’ and select the type of membership you would like. Electronic memberships starts from only £14 for two people for which you will receive our quarterly 40 page newsletter packed full of articles, photographs and news of events, the ability to buy and sell carnival glass on our members' area (etc, etc.) . Please 'Contact Us' if you would like further information. CGS members can read more about this benefit, including details of the fairs, dates, locations etc, in our Members Area. To obtain one of these cards, simply join the CGS !